An affluent time with books! Thank you for visiting our site, MAMUKAI BOOKS GALLERY. Compiled by a well-known Japanese actor and artist, Artfully Walking Tokyo and Beyond showcases hidden spots in Tokyo neighborhoods and suburbs with beautiful illustrations. Walking on his own, Takaaki Enoki discovered lesser-known but attractive places to visit, which he shares in this book: old shrines and temples in quiet residential areas; rare historical buildings not mentioned in general guide books. 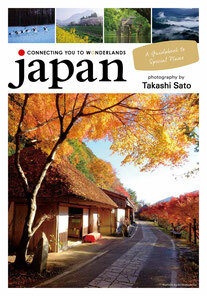 This volume also contains illustrated postcards and cutouts as souvenirs to help make your trip more memorable. If you are planning a visit to Japan, Artfully Walking Tokyo and Beyond is surely to be your perfect companion―before, during, and after your trip! USA, UK, Australia, Canada market at 2016, and has expanded to other countries gradually. If you want to see examples of pages or buy ebook(kindle), click here! 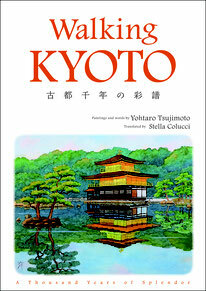 This collection features those sketches of Kyoto by Tsujimoto, who has been living there more than 40 years and drawing various sceneries through the four seasons. All sketches feature very popular sites where many international tourists visit, and historically notable places. Its official website (below) providing the map and travel guide to each place, this is a good visual guide to the city, as well as a perfect gift for anyone who loves Japan. USA, UK, Australia, Canada market at 2015, and has expanded to other countries gradually.